Limited release cigars are a mainstay, and occasionally you’ll see a cigar that has people rushing to buy one before it sells out. But when it comes to bourbon, there are an increasing number of bottles for which people will stand in line for hours just for a chance to buy certain high-demand bottles. For whatever reason, fall has become the season when the most sought-after bourbons are released. Pappy Van Winkle and the Buffalo Trace Antique Collection are the most prized additions, but increasingly in demand are annual releases under the Old Forester Birthday Bourbon, Parker’s Heritage, and Four Roses Small Batch Barrel Proof lines. In advance of the upcoming release of the 2015 Four Roses Small Batch Limited Edition, today I’m tasting the 2014 iteration. Four Roses distillery is unique in that they distill from 10 different bourbon recipes using a combination of two mashbills and five yeast strains, and the 2014 Small Batch LE uses four of those recipes ranging from 9 to 13 years. The barrel-proof bourbon is bottled at 111.8-proof and is copper in color. The nose is lush with fruit, caramel, and just the slightest hint of mint and wood spice. On the plate the complexity comes through with creamy notes, melon, dried fruit, and medium amounts of oak sweetness and spearmint. The finish lingers with soft oak, vanilla, and pear. For many great bourbons, what makes them great is barrel management and selection. The Four Roses Small Batch LE puts the distiller’s blending acumen to the test. With a rich combination of fruit, spice, and creaminess, the 2014 Small Batch shows off the skill of longtime Four Roses master distiller Jim Rutledge, who is about to retire. 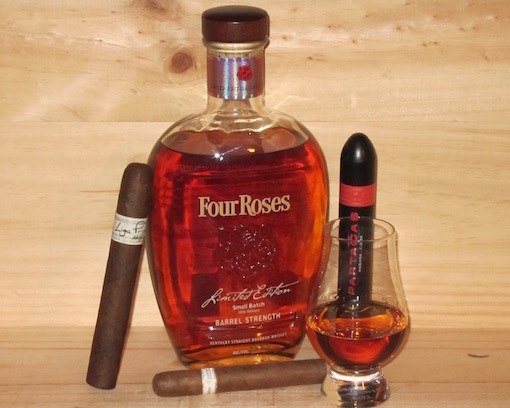 When pairing with a cigar, the Four Roses Small Batch LE 2014 benefits from a cigar that doesn’t overwhelm its complexities. I’d recommend mild- or medium-bodied smokes that feature good creaminess like the Davidoff Grand Cru, Illusione Singulare LE 2014, Padrón Serie 1926, or Paul Garmirian Gourmet. I’ve touted Four Roses Private Barrel Strength bourbons as a good value in bourbon, and so it shouldn’t be any surprise that when a master distiller gets to pick his favorites and blend them together the outcome is delicious. At $90-100 (if you can find it) the 2014 Four Roses Small Batch Limited Edition is a delicious bourbon and it only makes me look forward to the soon-to-be-released 2015 Four Roses Small Batch Limited Edition even more.